An old soul is someone who is thoughtful and contemplative. Even though they may be young, they see things through the eyes of someone with years of experience that make them wise to the ways of the world, causing them to think and act in a unique way. 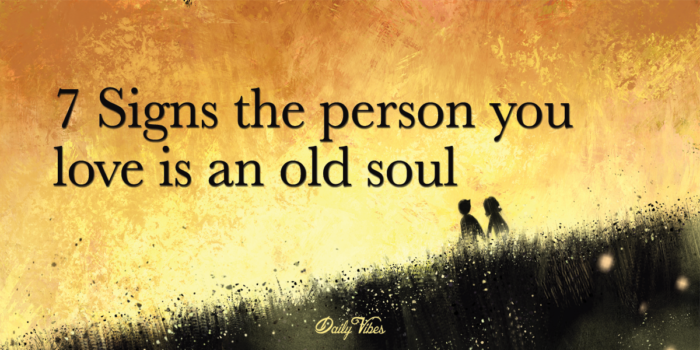 An old soul is a very special person. And, if you’re in love with one, you’re very lucky. How do you know if you’re in love with an old soul? Old souls need time alone to relax, recharge, and feel more connected to life and the world around them. Old souls are exhausted by social interactions and love nothing more than to be alone with their books, garden or working on a project. Don’t worry, they love spending time with you, too. They just need a short break now and then. They don’t need huge displays of love from you. Taking long walks, watching TV together, holding hands and talking mean more than anything. Old souls know that life if unpredictable, so they delight in the simple joys of life. And, one of those joys is just spending quiet, leisurely time with their partner. Old souls create an interesting dynamic in a relationship. They are teacher, lover, mentor, and companion all in one. They are able to teach you how to be more empathetic, how to be more in touch with yourself and the world around you. They can teach you the simple joys in life and how to be grateful for the little things. An old soul will be there for you no matter what, through thick and thin. They are the calm presence in your life. The person you know you can always count on. They are your rock. And, because of that, you infinitely love and trust them. Old souls give respect and expect it in return. They hate wasting time, and will not put up with someone who plays games. They will always be their honest, true self and expect their partner to be the same. Expect to be firmly, sternly corrected if you try to play games with an old soul. Old souls are not prone to cheating. An old soul is not driven by libido. They don’t need the excitement of a secret rendezvous to feel alive. They prefer to keep their lives as free of drama and conflict as they can. They love and respect your relationship too much to put it in jeopardy by cheating. Besides, you’re their bliss. They don’t need anyone else. An old soul will love and accept you unconditionally because they see the beauty in your soul. They have the ability to put up with a lot, and they will; but they will not be used. If you throw the relationship off balance by unacceptable (to them) behaviors like lying, infidelity, substance abuse, illegal activities, etc., don’t expect them to put up with it. They will move on and find another, more fulfilling, relationship.